The santur belongs to the family of instruments named "Yatyg Sazlar"-that is, horizontally laying fc Instruments. The canun and nuzha are two other instruments of this type. The main difference between the santur and these instruments is in the way the sound is produced. The santur is played with light hammers. Hence, the santur is also considered a string percussion instrument. However, the canun and nuzha are played with the plectrum, so they are plucked (pizzicato) instruments. According to historical data, the word "santur" originates from the Greek word "psanterina". According to legend, the Hebrew king David was the creator of a number of musical instruments, including the santur. R. Yektabey notes: "This musical instrument is of very ancient origin. It's mentioned in the Torah under the name 'psanterin'. The word 'santer' represents the other (phonetic) form of this name." Other versions of horizontally laying musical instruments are widespread in Eastern and Western countries. The most ancient and simple versions are still found among the people of Tuva and Hakassia. Russians call the instruments of this type "gusli", Belorussians and Moldovans, "tsimbaly"; the Chuvash, "kjesli"; Tatars, "gusli"; Estonians, "kannel"; Georgians, "santuri"; and Uzbeks, "chang" and other names. 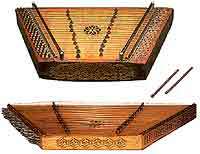 The Ottoman Turks use two kinds of santur: the Alafrang and the Turkish Santur. These versions of santur are very similar in terms of structure, performance, scale and other features. The diatonic santur with nine bridges is widespread now in Southern Azerbaijan (Iran). These nine bridges are on only one part of the instrument. In total, the instrument has 1 8 bridges: (9+9). The chromatic version of the santur has 24 bridges (12+12). There are some larger versions of the chromatic santur in Iran that are called "bem santur"-that is, the santur with a low timbre ("bam" is Azeri for "low"). The santur looks like a trapezoidal wooden box. The instrument consists of a frame, a top board and a bottom board. The total length of a santur with 12 bridges is 892 mm, the width is 315 mm, and the height is 69 mm. The instrument has a total of 96 metal strings. Four strings of the same tuning pass through each bridge. All of the wooden parts of the instrument are made of nut wood, and the pegs and strings-holder are made of metal. The bottom sounding board is seven-mm-thick board, and the top board is five mm thick. Players identify a "sol santur", "la santur" or "ti santur", depending on the tuning of the instrument. The santur is not considered to be a transposing instrument. The range of the santur with nine bridges goes from the "mi" of the small octave to the "re" of the first octave. The santur with 1 2 bridges ranges from the "mi" of the great octave to the "la" sharp of second octave. The santur can be used as a solo, ensemble or orchestral instrument.